Why a combined Middle & High School Session? We know that many youth groups and families have kids in both middle and high school, so we want to serve you by offering a camp experience specifically for you! While creating a program suitable for all of these ages, we take intentional breaks in the daily schedule to allow middle school and high school campers to encounter God in their own unique way. Camp provides an important opportunity for each camper to know that they are loved by God in the midst of the unique challenges that they face at their specific age. We recognize that this is a big task for our camp staff, but we hire exceptional college students and young adults to walk through these valleys and peaks with them. All staff are extensively interviewed and pass a background check. We have one staff member to every 4 campers to ensure that your child is supported and cared for during their session of camp. These are sessions for high school campers to choose from to help answer some of their most pressing faith questions. Some of our sessions include: What is the Bible? What is love? What is my spiritual growth path? We block out the rest of the morning to spend time together as a cabin. This is for team building activities, games, and tactile experiences that reinforce the theme of our week that campers hear about in our Morning and Evening Gatherings. Each day we open up all of our camp activities and facilities for campers to hang out with one another and our staff. 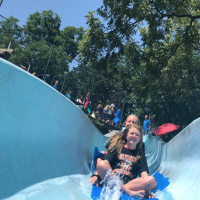 In addition to our main attractions (pool, splash park, waterslide, ropes course and more), there are organized activities offered throughout the afternoon. We offer freedom for kids to learn how to make choices on their own and build authentic relationships with one another and God in the context of camp community. At the same time we value camp being a safe place for kids that is appropriately supervised. Each night at camp has a different theme (or what we call Hype), and staff and campers will dress in costumes for all out fun and craziness. Stay tuned for this year’s theme days! After settling down and getting ready for bed, campers will turn lights out and get some Zzz’s in order to be ready for another day of camp!